Over 201 Worry-Free HCG Maintenance Recipes by Linda Prinster and Leanne Mennemeier is a great HCG resource when making your way through the HCG Maintenance Phase/Phase 3. For many people, this part of the HCG Diet is the trickiest since there are so few restrictions compared to the Very Low Calorie Diet that they don’t even know where to start. This book is the answer. Over 201 Worry-Free HCG Maintenance Recipes begins with a few notes from the authors about HCG Phase 3, and then it goes right into the HCG recipes: beverages, breakfasts, breads, appetizers, and so on, through desserts and a handful of 2nd three weeks recipes. With each recipe, you get a breakdown of the nutritional content (calories, fat, carbs, etc.) as well as a cautionary note if the recipe is high in fat. The only thing not provided with each HCG recipe is if there are cautionary ingredients in the recipe. It is up to you to find out which ingredients (things like peanut butter, almond flour, cream cheese, etc.) may negatively affect you while on Phase 3. This can be done by following the HCG food chart from the HCG Weight Loss Cure Guide by Linda Prinster, or the Pocket Guide to the HCG Protocol by Tiffany Prinster and Linda Prinster, and trying just one cautionary item per day. You will see that in the Over 201 Worry-Free HCG Maintenance Recipes Book that most HCG recipes are centered around protein. As you may know, protein is a very important part of HCG Phase 3 (also known as HCG P3) because it helps maintain your weight loss that you achieved during the weight loss portions of the HCG Diet. The Over 201 Worry-Free Maintenance Recipes book has been said over and over again to be the best guide for HCG Maintenance because of the vast amount of HCG P3 information and HCG P3 recipes. 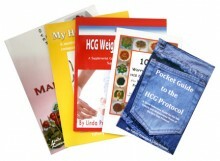 Recipes Book and the other HCG Books Click Here!